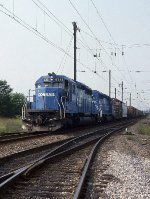 Description: A "sea of Conrail blue" fills the former Richmond, Fredericksburg, & Potomac Yard. No photographer lsited and the date is approximate. 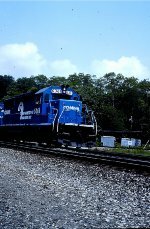 Description: Eastbound merchandise freight CGAL (Corning, Gang Mills, NY to Allentown, PA) rolls under the Pine Street bridge behind Conrail SD40-2s 6489 and 6361 on the Lehigh Line at Catasauqua, Pennsylvania, USA, 12 August 1982. 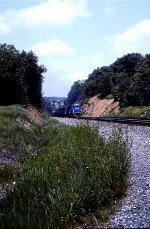 Description: PIML rolling through Lewistown station. The old "Broad Way" isn't so broad, anymore, as the recent removal of yet another track attests.